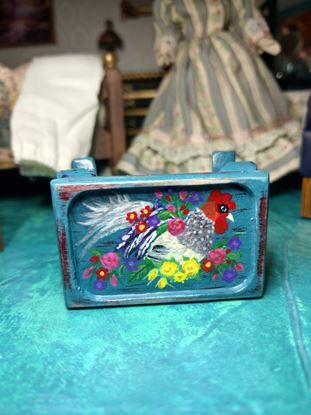 This is a refurbished little table that has been painted with a rooster and tiny flowers. It measures 1 7/8" long x 1 3/4" deep x 1 1/4" tall. Miniature Table and 2 chairs. Table measures 4.25" long x 2.5" wide x 2.5" high. 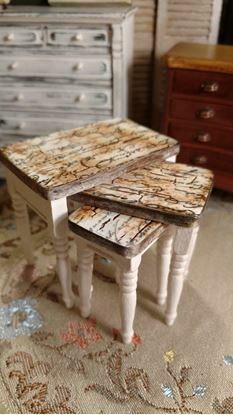 Super cute hand painted table and two chairs. Pieces are made of wood. The shelf is made of wood and it can hang on the wall or sit on top of something else. Painted and aged in a dark green. All of the items shown on it are included. 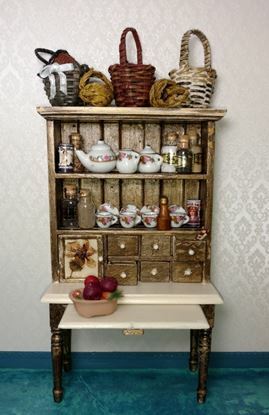 Each item was hand painted and embellished to look aged. Plates were painted with a floral motif and they come with the stands. This sofa has been re-covered in yellow fabric with tiny pink flowers. Piece measures 5.5" l x 3.5" h x 2 3/4" d. Upholstery is permanent. Sale is for the sofa only. All other items are just for staging. Thanks for looking. 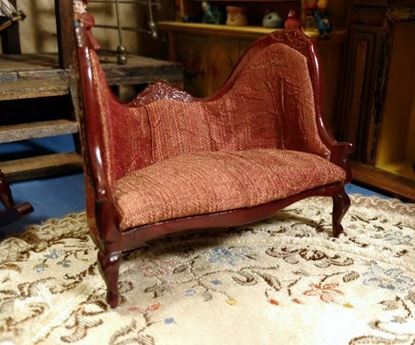 This chair has been covered in layers of fabric to achieve a comfy well used look. Piece measures 3.5" h x 3.25" w x 2 3/4" d. All upholstery is permanent. 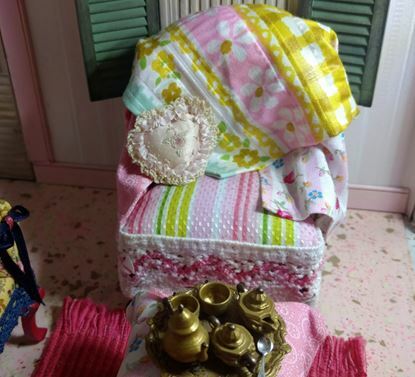 Comes with an ottoman that is also covered in layers of fabric, a small pillow and a tea set. Sale is for the items in this listing only. Thanks for looking. The hutch with all the accessories and baskets would look amazing with all the muted colors in it. Measures 7 1/4" high x 4" wide x 1 1/2" deep with the extended table pushed in. Drawers and door function. Handcrafted of solid wood, never displayed. The boxes are scuffed up from storage. New in the box, selling for less than wholesale. 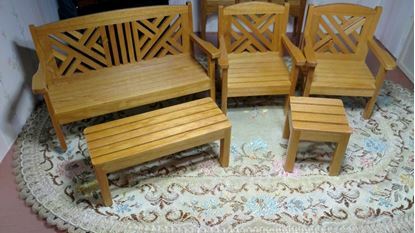 Set is crafted of durable carved wood for counter top and stool seats. 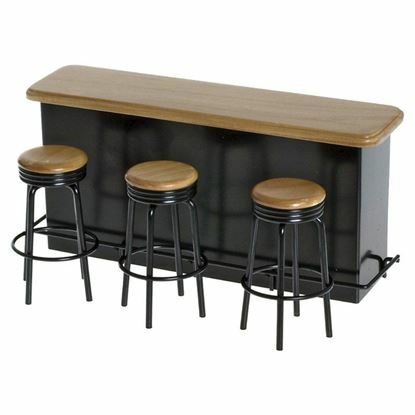 Includes counter and 3 stools. Black metal base and oak finish on counter. 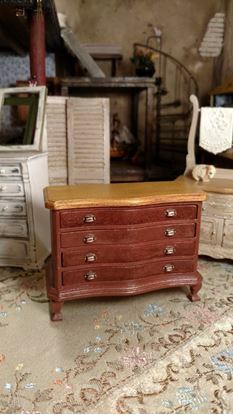 Counter: 7 1/4" w x 2" d x 3 1/2" h. Stool: 1 1/2" w 1 1/2" d x 2 3/4" h.
5 pieces of wood furniture by Town Square Miniatures. This set is new in the box. Coffee Table – 1 1/2" h x 1" d x 3 1/2" w. End Table – 1 1/2"h x 1 1/2" d x 1 1/2" w. Garden Bench – 3" h x 2 1/4" d x 2 3/4" w. Chairs – 3" h x 2 1/4" d x 2 3/4" w. Made of solid wood stained in a maple finish. Made of wood and stained in medium oak from the factory. This is in excellent used condition. Three small drawers and three open shelves. 6" h x 4 1/2" w x 1 1/2" d.
Made of wood and painted white from the factory. This is in excellent used condition. Three big drawers with three open shelves. 5 3/4" h x 4" w x 1 1/2" d.
This is a little swing that is so cute. The bear is glued to the metal swing but I'm sure it wouldn't be too difficult to remove him if you wanted. The entire thing except the swing is made of resin. falser intended for small children. Measurements shown in pictures. 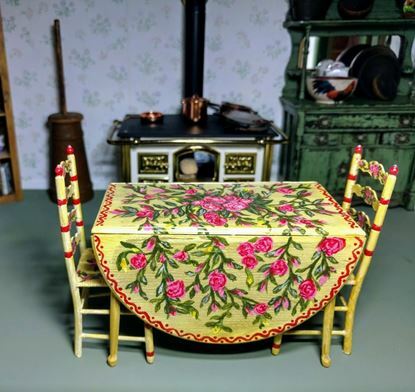 This completely handmade dollhouse kitchen counter stands 6.5" H x 1 7/8"D x 2 7/8" W. Comes with all the hand crafted items that are shown with it. The items I offer are 100% for the adult collector, not intended as toys or for children. 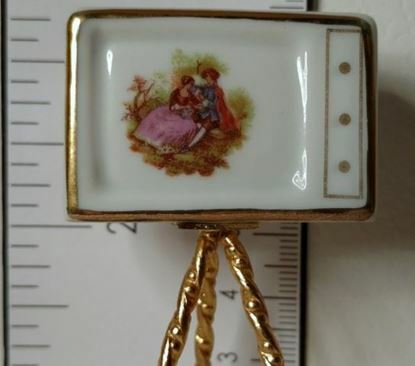 Tiny porcelain Limoges television set. This could work in a half 1:24 scale setting. not intended for children. Rustic white over mahogany with pearl colored pulls. Drawer and door operate. Real white marble top. In March 1981, Hunt Mfg. Co. paid $13.9 million for two properties previously owned by CBS Inc., the X-Acto company, which made hobby knives, and The House of Miniatures company, which sold dollhouse miniatures through the mails. Both remained in Long Island City, New York. The Hunt Mfg. Co. notice went on the boxes in place of CBS. 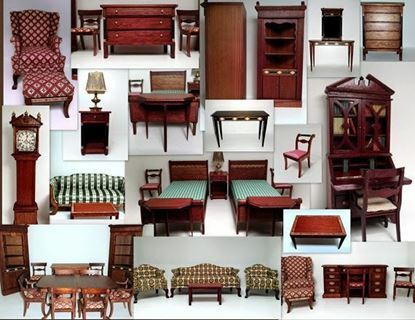 In 1983, HoM introduced their Coronation Series of artisan furniture pieces as high-end collectibles. Beautiful Upholstered Canopy Bed. The bed is made of wood and is elaborately covered with white matching materials. The sale is for the bed only. The bed measures 6 3/4" H x 8" L x 4" W.
3 3/4" long x 3.25" high x 2.5" deep. Rust color fabric. 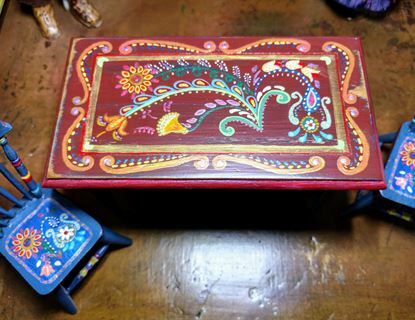 Three hand painted tables. Beige bass paint, Crackle finish, French script, and rust colored antiquing gel. Clear coated for protection. Dollhouse twin bed in golds, rusts, & burgundy. This was a Sonia Messer piece that had saddle horn type posts on the foot board and one was broken off a gone. I had to get creative in order to save this beautiful piece. Sale is for the bed and bedding. 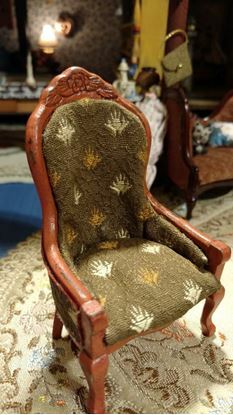 Victorian chair refurbished in a rustic burnt orange and upholstered in a green with gold accents material. Piece measures 4" h x 2.25" w x 2" d.
Shabby white tall hall mirrored table. 7" h x 2 1/4" w x 1 1/4" d. Very nice piece. This chair is in pristine condition and it's gorgeous, comes with original box. Mahogany color and made of wood. Made in the Republic of China by Fantastic Merchandise (pre-Bespaq) and measurements are 4 1/8"h x 2"w x 1.75"d. not intended for kids. Antique gold top, burnt sienna base, brass drawer pulls. Clear coated for protection. Handmade Metal Bed w/pink dolls for bed posts. This little bed is 1" scale and it is a full size bed. Measurements are 6.25" long x 4.75" wide and the headboard is 4 7/16" high including the doll. 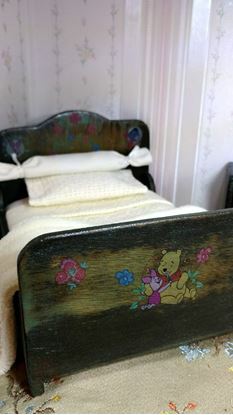 The bed is painted light pink and the doll bed post are painted a bright pink. The bed is made of copper, the doll post are metal and the feet are plastic. The bedding has a fixed bottom sheet, top sheet, comforter, fur throw and four pillows. Please note that this sale is for the cabinet and towels only. All other items are just props. 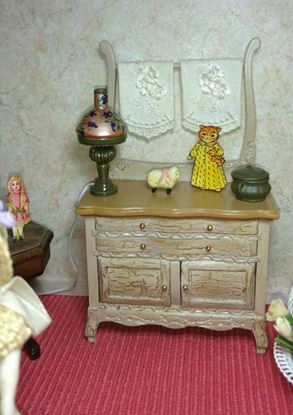 Dollhouse commode, and handmade towels. I painted the top in an antique gold and the base is an antique beige over crackle that was applied sparingly to specific locations. The scale is 1:12 and it measures 5.5" tall x 3 1/4" wide x 1.5 deep. This is a very old wooden bed and night stand that I have added a few of my own touches to. It measures 6 5/8" l x 5 1/8" w x 4" high at the highest point on the headboard. This item is not intended for children. The bedding is an off white and is permanent. Drawers and doors function. 4 1/16" tall x 3.5" w x 1 7/8" d. Nice piece, much prettier in person. 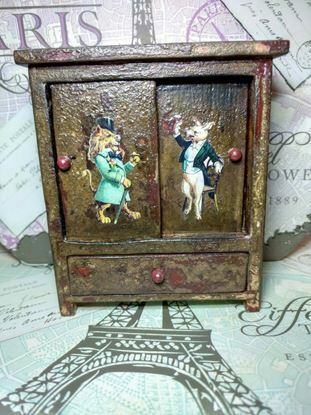 Rustic little cabinet with sliding doors. 4" h x 3.5" w x 1.5" d.
This is a nice vintage bench with a place for a baby to sleep? It is on the larger size so it would be great used as a bed next to a fireplace. It's really nice though and in the perfect setting it will look amazing. Not intended for children, Very fragile. 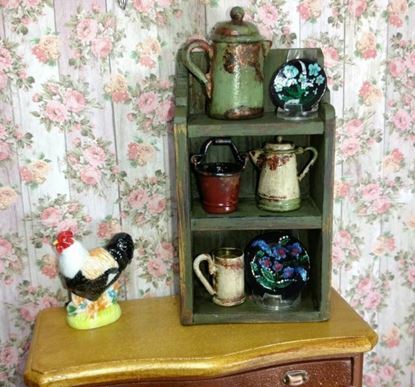 This is an eclectic set of furniture that I painted to match. I used and oil based enamel paint and sealed with polyurethane. 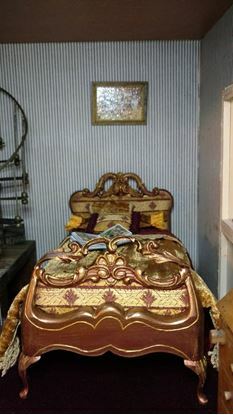 Set includes the accessories shown in pictures 1 and 2, and the two dressers, bed, and bookshelf. The bed comes with the bedding. I made the bed using 1" mini's instructions from their website . The bed measures 7.5" long x 4" wide. The dresser drawers do open but they were snug before I painted so adding the paint and sealer... well they are tight! These items are not intended for children. 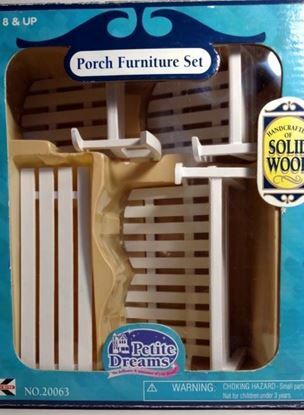 This completely handmade dollhouse bathroom counter stands 6.5" H x 1 7/8"D x 2 7/8" W. It was made using several strips of wood that was glued together and sanded smooth and sealed. Comes with all the hand crafted items that are shown with it. The items I offer are 100% for the adult collector, not intended as toys or for children.